Brunei has a very long history. In the Chinese historical records, Brunei has already existed by 518 CE (Common Era – the new replacement for AD which stands for Anno Domini – the year of the Lord, CE is supposedly neutral) and known as Poli. By the time of the Sung Dynasty in 1370 CE, Brunei was known as Puni. History suggested that when the capital of Brunei was moved from Puni to the present area, the name Brunei came into being with some suggesting that when the founders found the capital they declared it as ‘baru nah’literally translated ‘now we found it’ which eventually became Brunei. 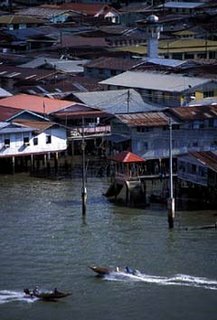 Kampong Ayer would have existed as early as the reign of Sultan Muhammad Shah who ruled from 1363 to 1402. It was described by Pigafetta, an Italian traveller that the water village made up of about 25,000 households with a palace built in the middle. The water village was a major port with Brunei exporting a variety of goods. However the fortunes of Brunei declined with the loss of of its huge empire. By 1840, it was only a shadow of its former self with a population of about 15,000. The water village remained and is still full of history. Most outsiders and even Bruneians assumed that the water village is only one village. Most do not realised that the water village is divided into 6 mukims (or counties) and made up of many villages. In general, the village names are based on the VIP who lived there, the specialist trade of that village, the place where it located or on a famous occassion or celebration. For instance, Kampong Sungai Kedayan, Sungai Asam, Pekan Lama, Sungai Pandan, Lurong Dalam, Lurong Sikuna, Sungai Si Amas, Ujong Klinik, Sungai Kebun dan Bukit Berumput are names based on local places or rivers. Kampung Sultan Lama, Pengiran Bendahara Lama, Pemancha Lama, Bakut Siraja Muda, Pengiran Kerma Indera Lama, Pengiran Tajuddin Hitam , Setia Negara, Setia dan Setia Pahlawan are based on the titles or names of VIPs. Kampung Peramu, Pekilong Muara and Pandai Besi are named after the craftsmen of the villages. So is Kampung Saba which is originally Kampung Pabalat. The oldest kampungs include Kampung Sungai Kedayan, Burong Pingai, Saba and Tamoi. Kampung Sungai Kedayan used to be where the rich traders stay and most senior government servants come from there. It still retained a certain aura even today when some seniors would describe that village as their ‘origin’. Some names have changed over the years, Kampung Sungai Pandan used to be called Sungai Kuyuk. Bakut China is now Pekan Lama. Interestingly Lurong Sikuna is derived from the English word schooner as this is where in the old days ships were anchored. There used to be called Kampung Antarabangsa (International) but renamed as the less upmarket Ujong Kelinik. Some kampungs were absorbed and their names disappeared. These include Kampung Kandang Batu and Alangan. Some have changed names because their craftsmen changed, for example, before Pandai Besi, it used to be called Padaun and Pemeriuk. Some kampungs have disappeared completely. An English Historian in the mid 19th century wrote about some kampungs such as Kampung Saudagar, Pasir, Belanak, Panchur Berasur, Tekuyong, Pengiran Daud, Pengiran Ajak, Jawatan Jeludin which till now nobody can trace and place them. With the current efforts of rehousing and resettling Kampung Ayer residents on dry land, we are losing our history and the original culture of Brunei. I guess we have to progress and to find the balance between preserving the history and the culture and the need of a modern population.